A few weeks ago I wrote a blog entry about our Rainbow Swiss Chard that was going to seed. At that time, it was pretty with the colorful stalks shooting up and standing tall. That was on June 2. This is what it looks like now. Not very pretty, huh? The stalks have fallen over and are turning brown. I pulled up all but two of the plants because I needed the space for my basil plants. That's a basil plant on the far right. However, I left a red and a yellow chard plant to produce seed. When you take a closer look at the stalks, you can see the seed. Well, these are not really the seed. They are the seed pods. It is funny how they grow right on the stems. All you have to do to harvest them is to take your thumb and fore-finger and strip them off. They come off easily. Each pod contains several seed. The pods are hard and the seeds inside are tiny, so I won't bother with trying to break the pods open to get the seeds. I'll just plant the pods. Several plants may come up from the same pod, but that is okay. I'll just have more chard! This is going to have to be a quick post tonight because it is getting late and I've got tons of things to finish up. However, I wanted to share something that I've learned quite by accident. If you have ever tried to store cut basil in your refrigerator, then you know that it will not last very long in the frig. Even when sealed in zip-lock bags, it will turn brown after a few days. So, here is a better way to keep it fresh longer. Simply cut the stems so they are 3-4 inches long and put them in a jar of water on your kitchen counter. It will keep for days this way. In fact, the stems will begin to grow roots after a while and you could, if you so desire, stick them into pots of soil and have yourself new basil plants. The problem is, if you are like me by this time of the summer, you already have all the basil you need and don't need any new plants! Okra is beginning to come into season. It is one of my favorite vegetables and seems like I've been waiting an eternity for it. While many people do not like okra and it is often considered a "southern" food, I've found a way to cook it that I think anyone will like. So, give this a try. First, rinse the okra pods and drain in a colander. You probably know that most okra is green and you may not have ever seen any red okra. Today, I had 4 pods of red that I threw in with the green. Do not dry the pods. Leave them a little damp. Slice the okra into about half inch slices and put in a bowl. Sprinkle in some salt and pepper to taste and then add 2 - 3 tablespoons of cornmeal. Mix until all the okra slices have been coated with cornmeal. Next, add a couple of tablespoons of olive oil to a skillet and add the cornmeal-coated okra. I use a wok for cooking the okra. I bought this wok at a clearance sale one time. It was an expensive pan, but was on sale for half price, so I couldn't pass it up! I have found it is good for much more than stir-fries. And, as you can see, it has been well used. Cook over medium heat, stirring often to keep it from burning. After a few minutes, you will notice that the red okra turns a dark green. The slice on the left is a piece of red okra. Now, here is the secret of this recipe that makes it so good. When the okra is tender, beat an egg with a fork. And, pour it into the pan with the okra. Then, stir it around quickly so that the egg breaks up into small pieces and coats the okra pieces. Today, I served this as the main course, along with mashed potatoes, corn on the cob and tomatoes. Everything on the plate came from our garden. Even Tom, who is a mostly "meat and potatoes" sort of guy, likes okra fixed this way. So, I encourage you to be adventuresome and give this a try. You may discover that you like okra after all! Our tomatoes have started to ripen and, before long, I know we'll have an abundance. So, I wanted to share a preserving technique I found last year that worked really well and requires no special equipment. Always before, I have canned my excess tomatoes. This requires a water-bath canner and heating the kitchen up for a couple of hours during the hottest part of the year. So, last year, I decided to experiment with other ways of preserving them. I tried drying them and documented that in the following blog entry. Of course, this requires a dehydrator of some sort and, while dried tomatoes are somewhat of a delicacy, I found that I rarely used them. The other method I tried was one I liked far better and that was to freeze them. Here is the process I used. First, wash them thoroughly. Then, cut the stem end out along with any blemishes or bad spots. You do not have to peel them. Next, cut them into quarters and put them in a food processor. Blend them in the food processor until they are chopped into tiny pieces. In the mean time, set a colander inside a large bowl. Cover the colander with a large dish towel or cheese cloth and pour the chopped tomatoes into the colander. You want to drain a lot of the water out of the tomatoes. Set this in your refrigerator for an hour or so. In fact, you can leave it overnight. When you remove the colander, you'll have a good amount of juice. Don't waste this. It is good to use in soups and stews. Fill freezer bags with the chopped tomatoes, label and freeze. I used a lot of these in chili last winter and they worked great! Tom does not like, in his words, "big chunks" of tomatoes. So, if I use canned tomatoes, I usually put them in a blender and give them a quick whirl before adding them to chili, soup and so forth. So, blending them and freezing them like this saves me a step. Also, you do not have to thaw them before you use them, although it saves on cooking time. If you forget to thaw them ahead of time, you can go ahead and add them to the pan frozen. You'll have a solid chunk that you'll have to scrap on with a spatula or large spoon as it thaws until you can break it into pieces. A pint freezer bag filled with tomatoes processed in this manner holds a lot more tomatoes than a 16 ounce can because there is not as much juice. Finally, don't waste the stems, cores and bad spots you cut out of the tomatoes. These make good compost ingredients. Also, chickens love them! Tom has been digging our Yukon Gold potatoes this past week. I'm so happy to have fresh potatoes again that I picked out a couple of the largest ones to bake for supper. 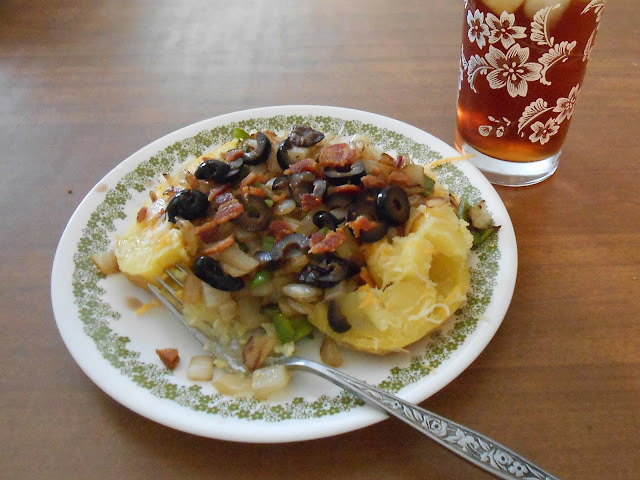 Quite often we have "loaded" baked potatoes as the main course for our meals. I like to saute onions and bell peppers in olive oil to put on mine. Sometimes I add sliced mushrooms. After the potato is baked, I chop it up and drizzle on olive oil. I have found that using olive oil, instead of butter, gives it a much lighter flavor and lets the taste of the other toppings shine through. Next, I pile on the onions and peppers and throw on some chopped black olives and grated cheddar cheese. If I have left-over bacon, I sometimes throw that on, too. But, I like the vegetarian version just as well. This makes a tasty and quick meal that is very filling and satisfying. It is one of our favorites. Our first planting of corn is ripe and ready to pick. Here is a sample. Now begins the fun part. Shucking it and getting it ready to eat! Tom is good at this. Quite often he runs across some damage, like this. If you've read this blog, you know that we do not use pesticides or chemical fertilizers. We practice organic methods in growing our produce. We are not certified organic and probably never will be. I checked into what we had to do to be certified and decided that it was far too much trouble (at least for the present time) and dropped the idea. But, I digress. The point I wanted to make is that we have to accept some loss to insects because we do not use pesticides and the above picture is an example of that. This damage was caused by a "Corn Earworm" which is the larvae of a moth. The caterpillar is 1 to 1.5 inches long and can range in color from pale green to pink to brown. In the picture above, the caterpillar was not present. Perhaps it had already completed its life cycle or crawled off somewhere. At any rate, it was gone and Tom just trimmed the bad end off the corn cob. And, it was ready to cook and eat. The next cob he shucked, however, contained a live critter! Eeeeeek! Sorry about that. I hope that didn't gross some of you out! But, as you can see the damage is mostly on the end and the rest of the cob is just fine. As in the previous picture, he just cut the bad end off along with the caterpillar. Even though we lose part of the cob, the caterpillars and bad pieces of corn cob are not wasted. We feed them to the chickens and they love them. We don't sell our corn at the market. We don't want people buying it thinking that it is going to be like all the other corn at the market, then being upset when they find a caterpillar munching on some of it. And, unless the corn has been sprayed with pesticide or is genetically modified, it WILL have some insect damage, like this. So, for the most part, we just grow corn for our own use or to give away to family and friends who understand there will be extra passengers in some of the corn cobs. Tom jokes that we should go ahead and sell it with a disclaimer that reads "Organically Grown. Guaranteed a worm in every ear!" But, I think that is a BAD idea! Last year we were experiencing a terrible drought with high temperatures in the 100s for days at a time. Over the course of the summer, the chickens ate every bit of plant material they could find in their pen. As illustrated in this post from early May, there appeared to be very little grass left in their pen. We've had quite a bit of rain this spring and the situation has changed. Instead of bare dirt in their pen, they now have a jungle to explore. Here's what I mean. As you can see, there is still some bare dirt up next to the coop itself. They tend to spend the hottest part of the day in this area since it is shaded from the afternoon sun. Those tall plants are sunflowers. Last year, I gave the chickens some black-oil sunflower seeds, like we feed the birds. Just wanted to see if they would eat them. They pecked at them and ignored them until I got a brick and crushed the outer hull of some of the seeds to expose the inner part. Once they realized there was a yummy center to these odd black objects, then they gobbled them up. But, obviously, some of the seeds escaped being eaten and germinated this spring. They provide a nice shady area where the chickens seek refuge from the morning sun and under which they enjoy hunting for bugs. Unintended consequences sometimes are a good thing! Our daughter-in-law from the Dallas area visits from time to time. She is a city girl, but enjoys visiting and is always happy to help when she comes. 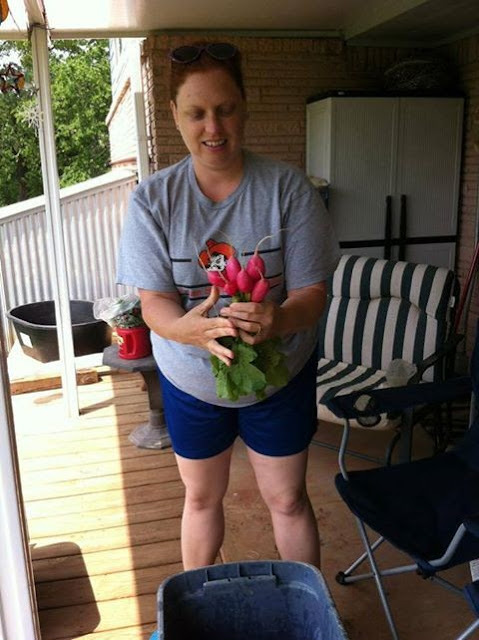 Here she is on the back porch helping bundle radishes for the market earlier this spring. 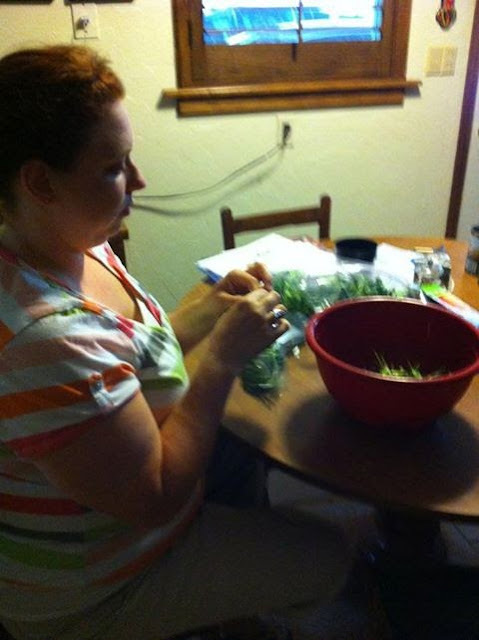 And, a little later that day she packaged sunflower sprouts for me. Just having an extra pair of hands was a great help and we finished work earlier that day than we usually do. After the work was done, we sat on the front porch, enjoying the evening and drinking a glass of wine. As we sat there, she said this was our "non-work porch", as opposed to our back porch being our "work porch". About a year ago, we had a sidewalk installed leading up to the front porch and had some landscaping done. So, this is a pleasant place to sit and relax. Here is a picture taken on the front porch. Our back porch, on the other hand, faces south and is where we wash produce and get it ready for the market. It does not have nearly as pleasant an atmosphere as the front porch. Here is a picture of it. As you can see, the daughter-in-law was right-on in her assessment of the two areas. Tom and I have even picked up using the terms "work porch" and "non-work porch" to refer to them.......as in "If you need me, I'll be out on the work porch." or "I'll meet you on the non-work porch." Funny how new terms get coined and take on a life of their own!